Its Christmas time!! People are frantically shopping and trying to get as much as they can of the Christmas markets. Though the feeling is of a happy one around, we're also mentally preparing for the three days of absolutely vacant streets and silence. It is as if the entire town will go into hibernation for three whole days. Is it this way every where else? I know for sure this never happens in India. My country never goes quiet ,well, except for nation wide strike or protest known as Bandh (meaning "closed"). Be it Diwali, Dussehra, Christmas or Ramzan, it is always business as usual. I am continuing with my cast on stitch experiments. 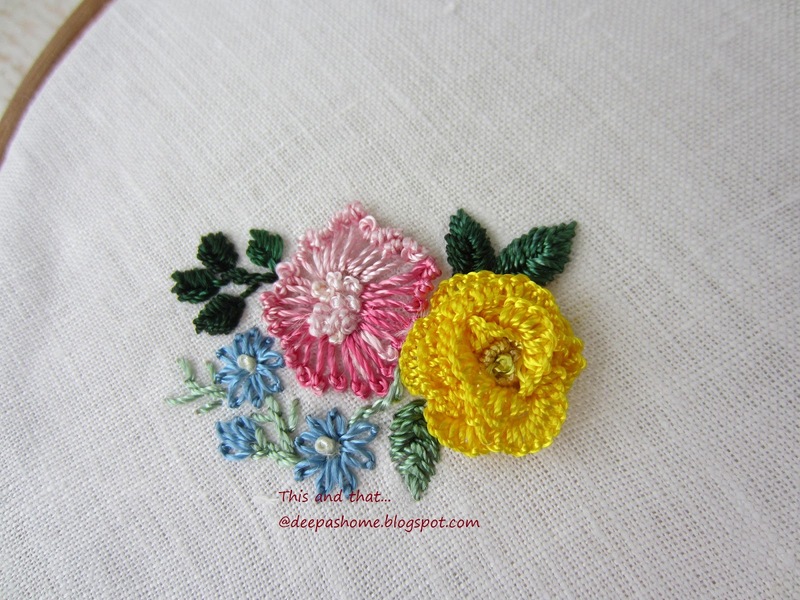 This was just a trial piece where I tried to stitch the rose without any borrowed patterns from books. It worked ; but needs to be polished up. 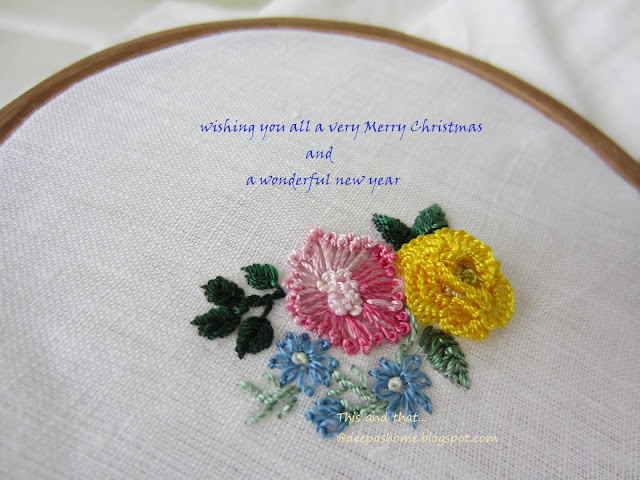 For the next year, I have plans for multiple Brazilian embroidery project as gifts for my friends. More about it in the next post. Japan is another country where Christmas does not stop things - on the contrary, it is a good business opportunity and hope and restaurants are open as usual, or even longer. I think you can use those three days of 'hibernation' to work on your embroidery. The Cast on Rose is impressive. Looking forward to your new projects in the coming year. I don't know whether everyone else in the UK hibernates for three days, because we do, as far as we can! There may be small towns in the USA that shut down for the holiday, but I doubt it. Most everyone is open right up to the last minute (midnight) for last minute shoppers. Christmas Day may be quiet, but most everyone I know is bustling around from one family to the next. At my house, we will stay in and enjoy the holiday. Merry Christmas to you and wishes for a serene and happy holiday.